Hello lovelies, I have been in busy yesterday organising and cleaning my craft room. It was a real mess. I need to rethink other ways to store some of the products like pens, inkpads and basics tools which I reach for often. The desktop need to be tided up. Inkpad storage also needs changing. It is still work in progress. Have to look into more storage options. Anyway, a few minutes into it, I got distracted and make this card. Had to share it with y’all today. 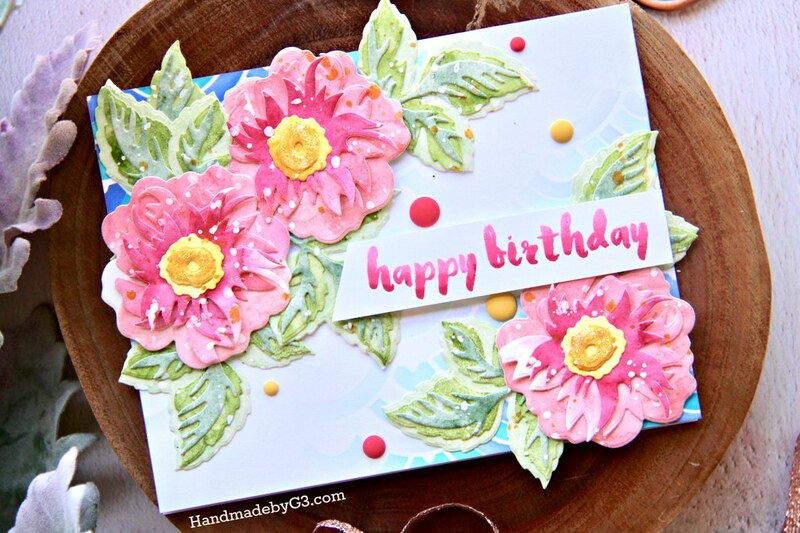 This card uses the newly released Wild Roses 3D dies from Altenew. I am a sucker of their 3D dies. So when they released three of them, two of them came home to me. My budget only allowed me two of the set. That is awesome. I used the Altenew watercolor pan set to watercolour a bunch of watercolour paper to die cut these gorgeous dies. I used Cotton Candy, Coral Berry and Rubellite for the flowers, Fresh Lemon and Warm Sunshine for the flower centers, Frayed Leaf, Forest Glades and Evergreen for the leaves. Then I stacked, glued and assembled the flowers and leaves. How gorgeous are they? I am in love with the soft watercolour layers. I spattered the assembled flowers and leaves with Altenew Pure White and Gold Metallic sprays. This adds to the texture and artist feel to the flowers. For the background, I used the Scallop Builder stencil. Sponged Mermaid Lagoon and Blueprint Sketch distress oxide on it diagonally opposite to the panel fading in the middle. I then clustered glued the flowers and leaves on top of the stenciled area. So unfortunate this stencil background is covered mostly but still adds interest to the background. 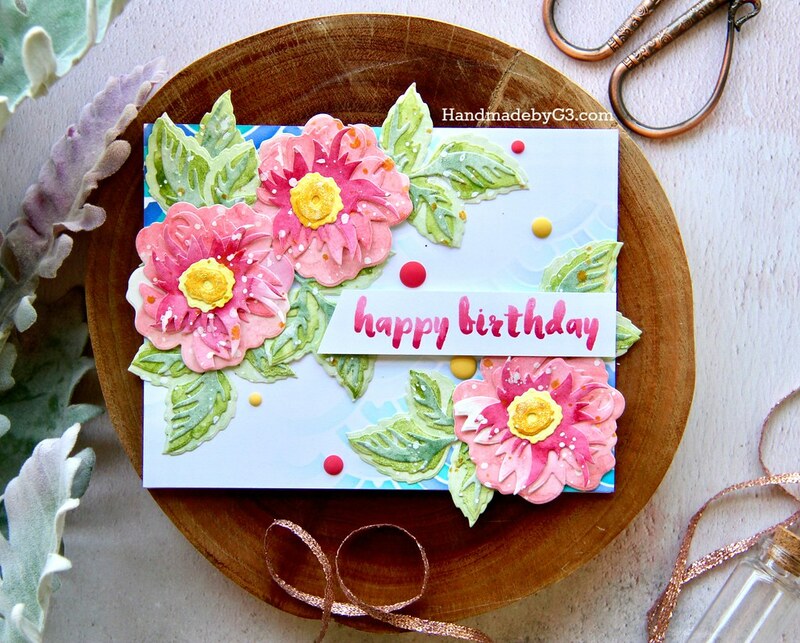 The sentiment is from Painted Greetings stamp set which I stamped in Cotton Candy, Coral Berry and Rubellite ink for the ombre effect on white strip of cardstock. I adhered the sentiment as shown. Finally a few Altenew matt enamel dots to finish off the card. This card came together really quickly. It is super hot here in Perth. 35C plus for past few days so the watercoloured panels dried very quickly for me to die cut them and assemble. Then the rest of the card came together easy. Sometimes, not over thinking and just going with the flow works miracles. All the supplies used to make this card are listed below. Thank you very much for taking the time to visit my blog today. Have a lovely weekend! 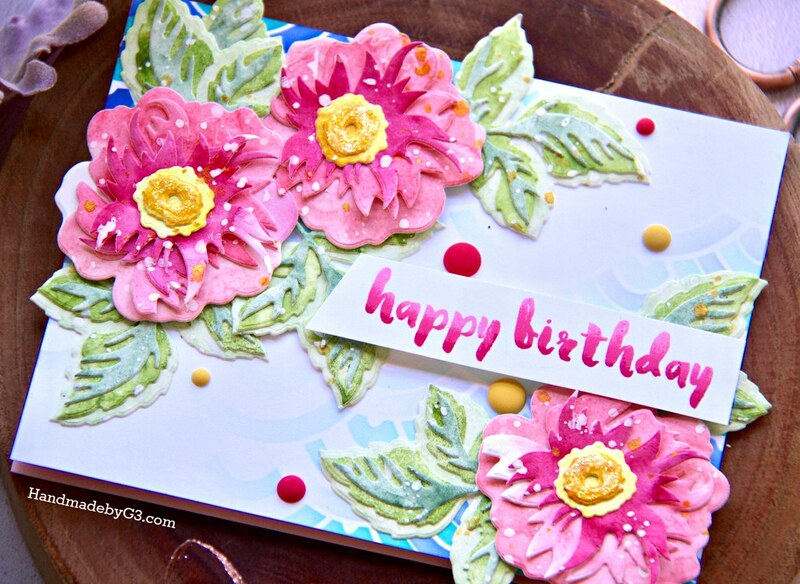 I immediately thought of Spring with this card – the splatter resembles polka dots as well as the colorful enamel dots and that always feels like Spring to me. It is so very pretty and this is the first blog I opened this cool foggy morning and it made me smile. Here is Florida it has been cool and I hope the Spring buds don’t grow too quickly and get frozen off! Your card was a happy way for me to start my day. Oh wow, this is so pretty. Love the colors, very springy. This is so beautiful, Gayatri! Stunning!! I love the colours you’ve used.